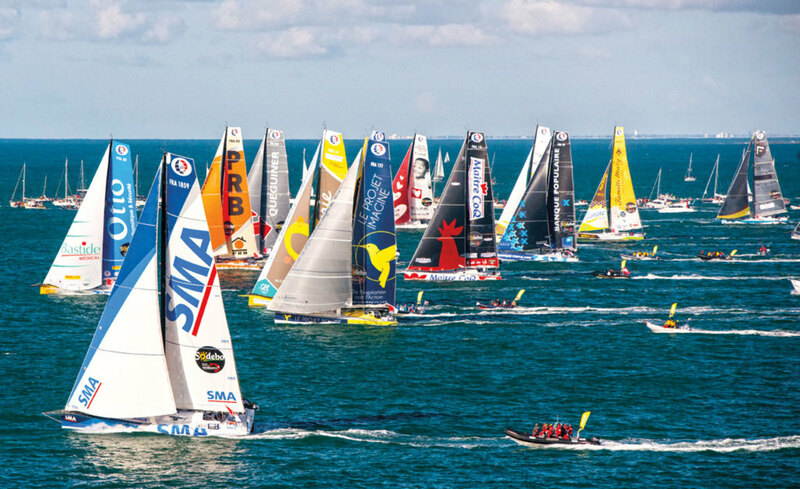 Before leaving for Les Sables d’Olonne on the southwest coast of France this past November I told some curious non-sailing friends of mine that I was off to witness the start of the most popular sailboat race in the world. “You mean the America’s Cup?” they asked. “Oh no, this is much bigger than that,” I answered. If you’ve ever been lucky enough to see a Vendée Globe start, you know this is true. For three solid weeks every fourth calendar year a veritable Woodstock Nation of sailors and non-sailors alike gathers in this otherwise innocuous resort town to pay tribute to a select group of individuals poised on the cusp of our sport’s greatest adventure: a nonstop race around the globe, singlehanded, in high southern latitudes, aboard some of the world’s most powerful and most sophisticated sailing monohulls. This year’s race village, as ever, was a community onto itself. There were two TV studios, a radio studio, a three-story media center full of print journalists pecking out stories on laptops, a veritable shopping mall of retail outlets, plus an impressive array of sponsor and event exhibits that were packed full of race fans from sunup to well past sundown. And when the moment came, as 29 competitors filed out the marina basin and down the short canal to the inception of a three-month ordeal that half the field normally cannot endure, the fans, as always, were out in force. A third of a million people pressed against the boundaries of the sea to express their enthusiasm in an endless keening roar of blaring boat horns and cheering voices. Every Vendée Globe start is unique in its own way, and this one was no exception. This was the most international start in the event’s history, with sailors from 10 different nations lining up before the gun. It was the first start in a long time, alas, that included no female skippers. It was also the first with more than one American competing. 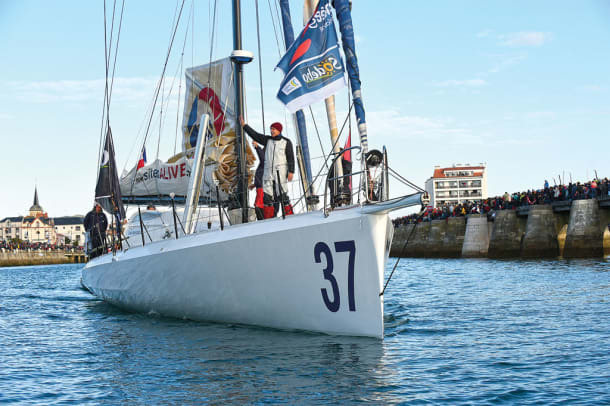 There was the venerable Rich Wilson, the oldest sailor (at age 66) to ever start the race, setting out on his second Vendée circuit, plus half an American, Conrad Colman, who carries passports from both New Zealand and the United States, setting out on his first. Most importantly, this is the first Vendée Globe—indeed the first round-the-world race of any description—to feature boats (seven of the 29 racing) with modern lifting J-foils. This technology first erupted into the common consciousness of sailing in the last America’s Cup, aboard 70ft catamarans racing round buoys with full crews on the comparatively tranquil waters of San Francisco Bay. Now it has been transposed to IMOCA Open 60 monohulls racing on the world’s most hostile oceans in the world’s most grueling solo-sailing competition. In an environment and a race this rigorous, it is a very open question whether the foils will prove a silver bullet or an Achilles heel. For more on the Vendée Globe start, the new foils, and the race’s impending outcome be sure to catch the March issue of SAIL. Be sure to also follow the ongoing race at sailmagazine.com/racing.